Shooting an elusive species such as jaguar involves long hours of searching, since they are very well camouflaged in the dappled light of the bushes and almost impossible to spot. And then, when you are lucky enough to spot one, even longer hours of waiting for the animal to come out into the open, or wake up and do something 'interesting'. This is one such example. For long periods of time this magnificent animal was lying mostly obscured in the shade on the top of the river bank. You have to stay alert with your camera ready since you never know when some action will occur. 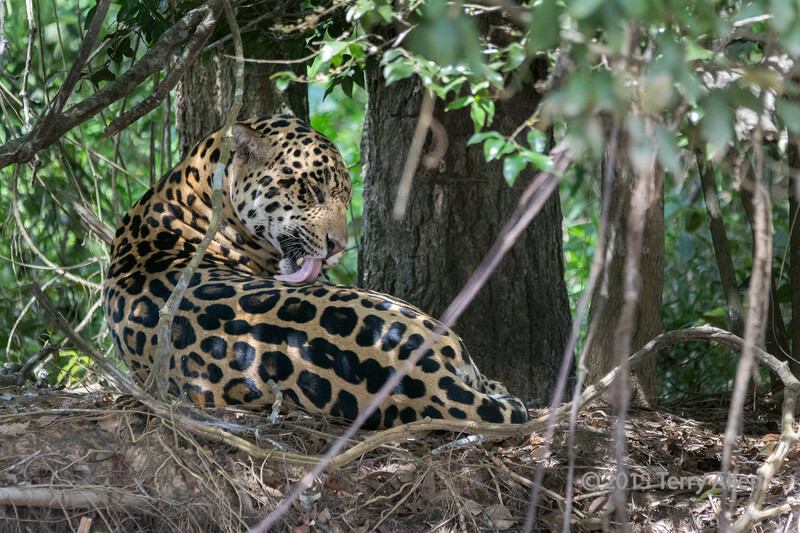 In this case, the jaguar briefy woke up and groomed itself (when I got this shot), and then fell asleep again.